In, through, and around Balboa Park are a multitude of trails and pathways for biking, running, and walking. The trails offer a wide range of sights and levels of difficulty and are a great way to feel out of the city without having to travel. An example of the official trail markings found throughout the park. 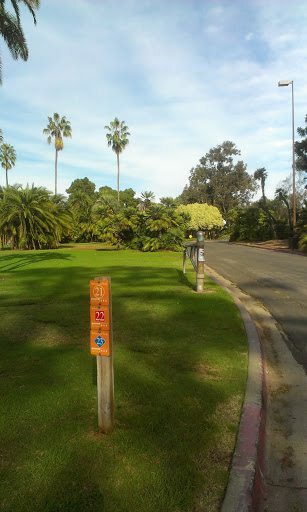 The number on the signs indicates which path(s) you are on. There are officially 65 miles of trails in the park, which are outlined in this detailed pdf map. 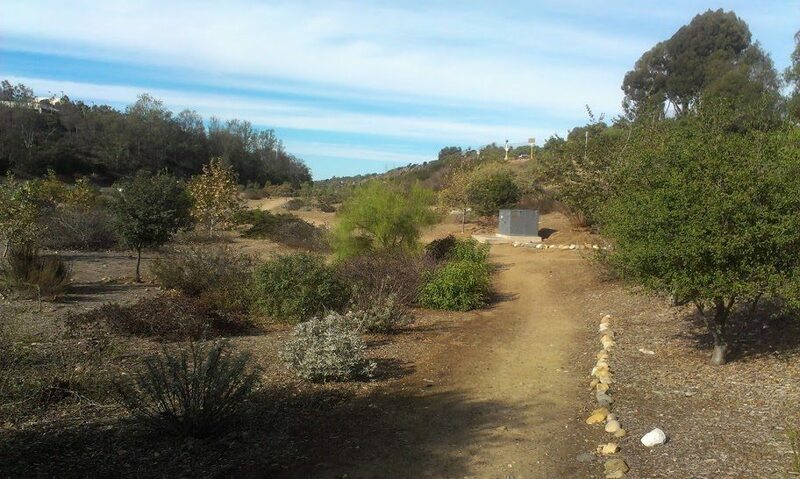 If you haven’t been on the Balboa Park trails before I recommend taking a look at the map before you head out since some of the trails and turns are not clearly marked. You probably won’t get lost if you don’t have your entire route memorized but you may end up going further than you intended. If you plan to explore the trails on the east side of the park (east of Florida Drive) be aware that there are not restrooms nor water available in a large portion of this area. Florida Drive – the trail that runs along Florida Drive, just on the east side, is a dirt and rock trail with small hills throughout. Florida Drive is also a great biking route if you’re going from Normal Heights or Hillcrest toward Downtown. 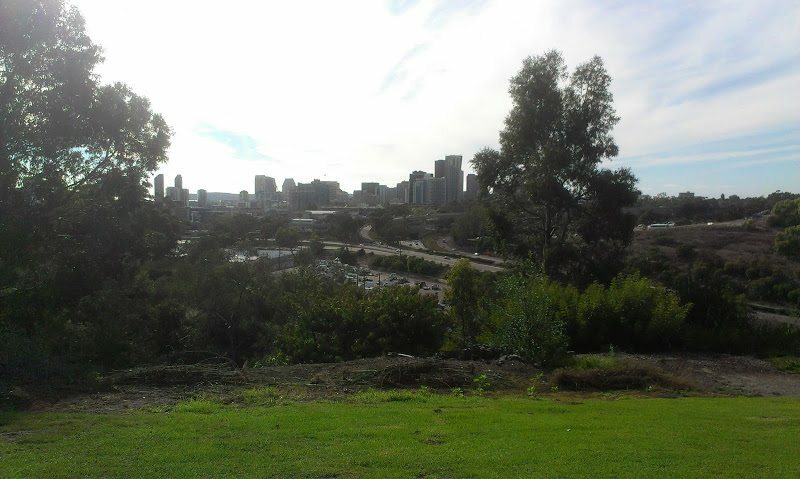 View of downtown San Diego from Golden Hill Park. Upas & Vermont – Upas Street ends at Vermont Street just west of Florida Drive. Continuing west on the Upas pathway the trail crosses the Cabrillo Freeway (Highway 163) – a hidden crossing that includes steep inclines and declines. Just before the bridge crossing the trail includes an option to turn right and complete a loop in the canyon on the south end of Hillcrest. This canyon area has recently had some very nice plantings installed which will make this an amazing part of the trail system in the future. Start of Florida Drive path with excellent plantings. 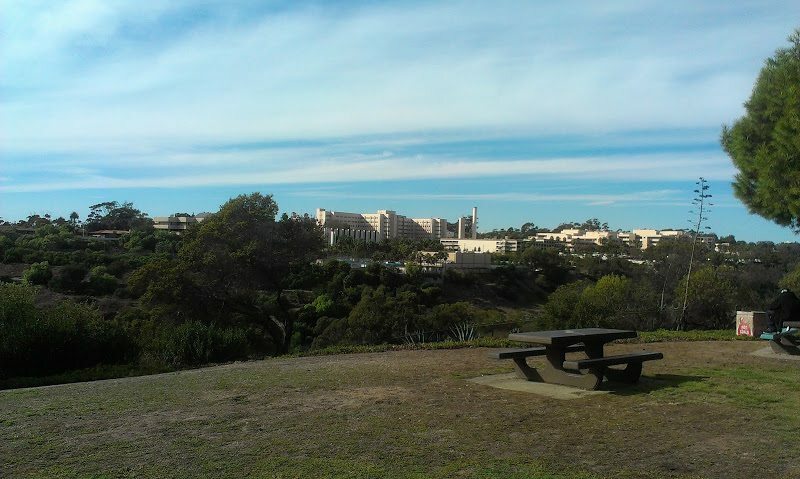 Whether you are looking for a new place to walk your dog, walk your child, or walk yourself Balboa Park has a trail option that will be well-suited to your needs. A small request from this reader – if you’re out and about on the trails (or elsewhere) take the time and effort to be friendly and say hello or give your fellow citizens a wave. It’s one of the small things that I love about San Diego and makes me smile regardless of how tired I may be. A slogan in Austin is ‘Keep Austin Weird’. For San Diego I think a fitting one would be ‘Keep San Diego Nice’. Hey John Patrick, what a delight! I read your article with a smile on my face and a feeling of happiness as well. I, too, have enjoyed walking many of the trails that you wrote about. But the one that surprised me was the one in Florida Canyon. When I “discovered it a couple of months ago, I couln’d believe my eyes. So I trekked down (with a fixed smile and a happy heart) from Morley Field and was mesmerized by the hiking trails, flora and fauna. Yes, I acknowledged other folks and greeted them with my smiling eyes. Remy, glad to hear you are a fellow trail traveler and I have no doubt your smile greeted others along the way. I just got back from a run in Florida Canyon – such a nice way to relax on a sunny Sunday.